When John Johnson and I were graduate students in the mid aughts, we monitored lots of stars for exoplanets. I was particularly focused on very long period planets whose orbits were just starting to finish after a decade of observation. 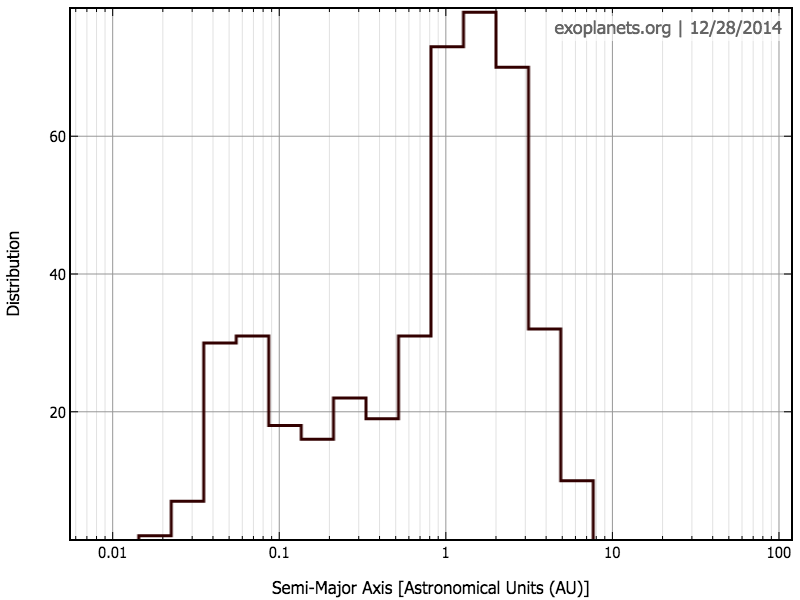 In my first postdoctoral work with Geoff Marcy, I described the “1 AU jump”: the discontinuity in the giant planet period distribution around 1AU, beyond which we suddenly find lots of giant planets. 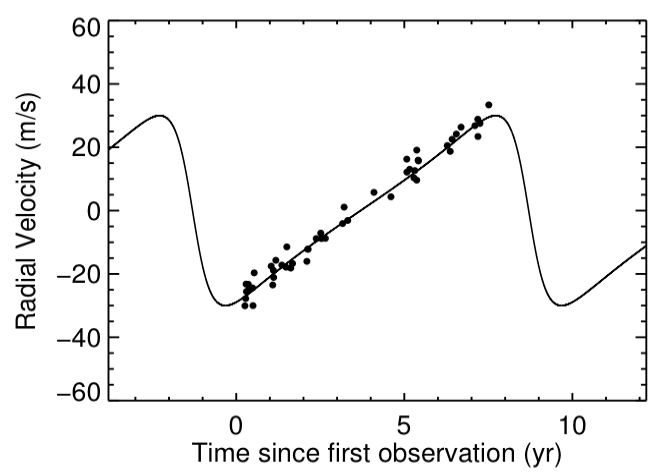 The cliff out at 5 AU or so is actually a selection effect: we have only been monitoring stars for of order 10 years, so there aren’t many planets discovered (by RVs) with periods longer than that. I was working on that edge. John was starting on brand new stars, mostly subgiants, to probe the effect of host star mass on giant planet occurrence. Fortunately for John, the 1AU jump corresponds to roughly a thesis project timescale: for the first year or so he was turning up nothing, and getting worried about the viability of his thesis. After about 2 years he had two complete orbits on lots of planets beyond the 1AU jump, and the rest is history. My undergraduate student, Y. Katherina Feng (now at UC Santa Cruz) just had her senior thesis accepted for publication in ApJ. She analyzed seven long period systems, including a couple that were in my thesis and hadn’t finished their first orbits yet. She used my and Andrew Howard’s RVLIN IDL package to perform orbital fits of long period planets with Keck data I had been collecting with Eric Ford with NASA time (thanks Andrew Howard, Geoff Marcy, and Howard Isaacson for their hard work on the California Planet Survey queue) Katherina used Sharon Wang’s BOOTTRAN program to determine the uncertainties in their orbital parameters. Ben Nelson also provided some dynamical analysis with Eric Ford, and also confirmed that the BOOTTRAN, bootstrapped parameter uncertainties for some of these systems were consistent with a proper MCMC analysis. GJ 849 is an M dwarf with a complex RV curve. In 2006, Paul Butler published the inner planet, and in 2013 Xavier Bonfils published a follow-up with HARPS data. Both authors noted a linear trend in their fit. In 2014, Ben Montet studied the system and found a poorly-constrained fit for the outer planet, with a period of something like 20 years. 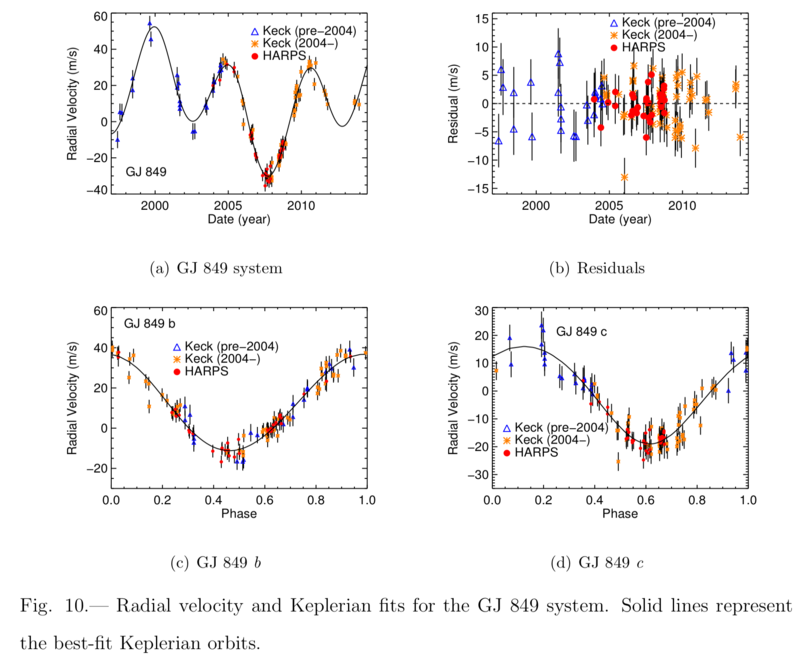 A few key RV points since Ben’s analysis, and the published HARPS data, allowed Katherina to show that the outer planet of the system had finally finished its orbit, and to get a good constraint on its period: 15 ± 0.7 years, which is safely the longest measured period for any planet orbiting a star less massive than about 0.8 M☉ (the record holder for all stellar masses is β Pic b). Back when Geoff Marcy and Paul Butler started observing HD 145934, it wasn’t known at the time to be a giant star. They presumably included it because it appeared to be a nice, bright K star for their studies. It’s a giant, as is obvious from its spectrum (narrow lines and all), and indeed Takeda in 2007 found its mass to be 1.7 times solar (to give one example of someone noticing). But it was showing interesting RVs, so we kept monitoring. It has a strong linear trend, meaning that it’s probably in a binary system, but superimposed on this trend is a nice, periodic signal. Katherina was able to tease the two signals apart, and discover a 7.5 year, 2 Jupiter mass planet orbiting the star. The planetary system with giant planets with the largest period ratio is HD 187123. This system has a 3-day hot Jupiter, and then a long gap with apparently no planets until something waaaay out in a long period orbit (which I described in my thesis). Katherina has shown that HD 187123c has finished its outer orbit, and the period ratio is over 1,000. Is this an example of a Kozai perturbation, where the outer planet is inclined and has excited a high eccentricity in an inner companion, which then tidally circularized into a 3-day orbit? 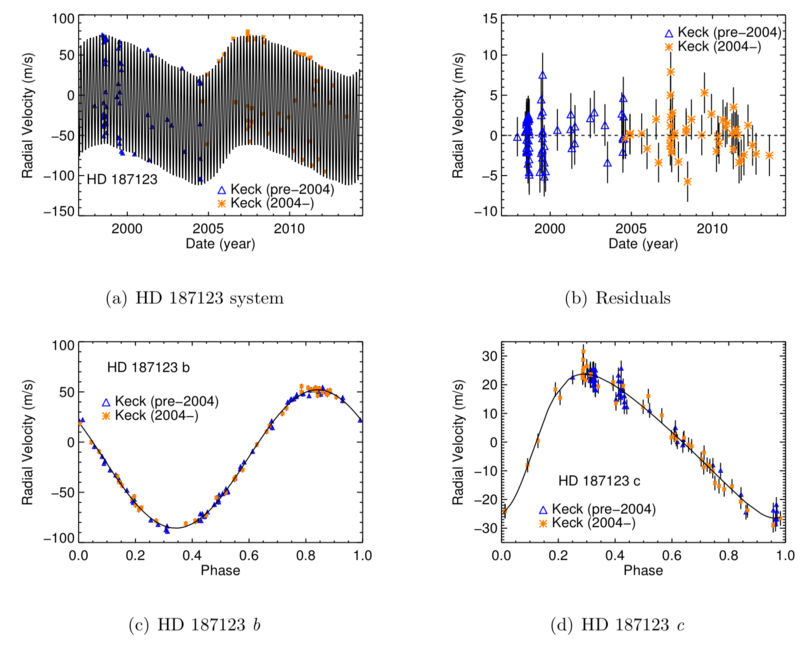 Katherina also, using some published SOPHIE data and new Keck data, nailed the orbits for similar system from my Berkeley days, HD 217107, which has a hot Jupiter and an outer planet with an even longer period (period ratio over 700!). One bit of analysis from my thesis that I had always meant to publish was how to measure the minimum mass of a perturber contributing a RV linear trend. If you have imaged the perturber, assume circular orbits, or have some other constraint and want to do a fancy Bayesian calculation, then you can do lots of analysis. Now, 7 years after I made those plots and done that calculation, they are finally in the refereed literature. The paper is now on astro-ph here. Enjoy! This entry was posted in science, Uncategorized and tagged science on January 6, 2015 by jtw13.